Interview with Tim Etchells. On art, theater, audience and ways of working as a director, performer and visual artist. 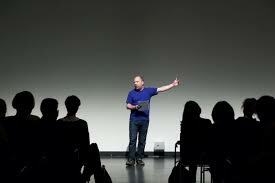 Tim Etchells is a writer, performance maker and an artist. Since over 30 years he has been the artistic director of UK based theatre company – Forced Entertainment. Tim’s portfolio concludes of numerous publications, books, visual art exhibitions, installations and performances. The Notebook, to which his works often refer to, is artist’s collection of language and contains fragments of texts taken from all that is around but also language originated by Etchells himself. In DeSingel he presented his solo performance ‘A Broadcast/Looping pieces’ and, as part of the Tracing Creation conference, he gave a keynote on creative processes. Kinga Jaczewska: What was your very first work that showed to public? In which form was it? Tim Etchells: It’s hard to say. A simple answer would be to start with Forced Entertainment’s first performance, in 1984, ‘Jessica in the Room of Lights’. K.J. : In your artistic practice you shift between various forms and medium. I wonder if that first form you worked with, theater performance, stayed as exclusive for quite a while or was it from early on that you began using different forms? T.E. : At the beginning it was mostly theater and performances but I was also already writing fiction alongside that. No matter what form I work in, I’m very often dealing with text so that feels like the real root to my practice. My notebook and with it the task of collecting fragments of language and using them in various ways – that comes from before Forced Entertainment was established. After a while, with the company, we made videos and installations alongside the performances – I guess, one way or another that led me to more solo visual art projects. K.J. : Gathered language, overheard conversations or movie dialogs are a big part of your notebook but also in ‘A Broadcast/Looping pieces’ performance which you performed at DeSingel. Seeing the piece it made me wonder if your work with text is based on its phonic qualities and intriguing constellations of words and meanings or do you also use it as a way to frame and shape ideas? T.E. : It’s all of those things I guess. My work with text is surely both, an act of collecting and an act of originating language in different ways. I gather text materials from many places – from dialogues, pieces of novels, theoretical texts, and graffiti phrases – but alongside that, I keep on inventing text and writing fragments of my own. Everything finds its way into the notebook as well as into performative projects like ‘Broadcast’. K.J: After years of gathering written material, what triggered you to transform and to use parts of it in a solo performance? Was it some kind of need of recycling or sharing that originated ‘A Broadcast/Looping pieces’? T.E. : One of the reasons was that the recent work I’ve done with Forced Entertainment has used a very steady, straightforward, semantic approach to language. It’s often about a very simple kind of presence, about direct contact with the audience and about some kind of manipulation in the sense of what is happening in the room; bending the text around, using direct address. I like this approach a lot – but it leaves something missing. Noticing this development, I was left with some quite different instincts in terms of language – instincts that are more poetic, more fragmented and a bit stranger. I didn’t know what to do with those ideas and I, since we were busy with other questions, I somehow couldn’t find a way to explore them in the work with Forced Entertainment. Since a long time I’ve been gathering a lot of quite fragmented diverse language material – I tended to use it in writing or text projects in art but in terms of performance, it’s had no space for articulation. Making ‘A Broadcast/Lopping Pieces’ felt as if, after so many years of not really knowing what to do with that stuff, I found a way in which I could start to work with it and explore. It felt like a form in which I could work with repetition and fragmentation but also open up to a more poetical and musical relation to language that interested me. I was hungry to do something that would treat text and the architecture of a performance in a different way. Rather than following Forced Entertainment’s journey of trying to make a direct relation with the audience, this piece wanted to make something more ambiguous. K.J. : Is it the very first time that you approached this poeticism in a solo performance? T.E. : I have done things on my own that relate to it and there also are earlier Forced Entertainment projects where I am exploring a more poetic use of language, but ‘A Broadcast/Looping pieces’ did feel like a big step. It partly came out of the project I did in Brussels with Boris Charmatz in which a group of other artists also took part in. It ended in a two day long improvisation where public could come in and go out. During these two days I was constantly improvising using texts taken from various videos being shown in the gallery at that moment. I was talking all the time, skipping through parts of these ‘found’ texts and I felt I could continue for hours! I guess after that experience I thought I might have found a form in which I could approach my own notebook materials. K.J. : ‘A Broadcast/Looping pieces’ was created in 2014. I wonder if it is the same set of notes that you use since the very premiere or do they change, get added, delated? T.E. : Sometimes things are added but in essence I have decided that this particular set of cards is what the piece is. Fundamentally, I feel that the content is now set where at the beginning it was more of anything and everything structure. K.J. : Are you strictly following the cards or, according to the energy of each performance, you sometimes add a word or two from yourself? T.E. : Occasionally I say a line I remember from a card that isn’t in front of me but mainly I go with what I read. I’m working very fast. The fact that things are written in front of me takes off a certain kind of pressure. K.J. : At this moment Tim Etchells is a writer, performer, photographer, playwright, theatre director, visual artist, choreographer and lecturer. That is quite of a few labels. Do you work with these consciously while making works? Do these definitions affect you or your work in any way? you have to make for yourself or is it more ideas for which you find most suitable media? T.E. : It is both. Fundamentally I always put performance in the middle of what I do. My understanding of what art work is, regardless of the medium, has to do with a way in which it opens a relation to an audience, a spectator, a reader or a viewer. I think a lot about how the performance makes a proposition into the room and how that proposition gets negotiated. I think a lot about the space of an encounter that performance generates. I don’t think a lot of novelists think about that but I do. When I write fiction I think about the page and the way in which a page makes a proposition to a reader, about the performance of reading. I think the same when I make a neon sign for a gallery or a street corner, or a video work – this space of encounter. I am busy with ways in which the object makes a performative proposition to the spectator. The understanding of an artwork which I have gained through the years of working with a performance is present in whichever media I work with. At the same time though, at certain point I definitely have frustrations with the economy and restrictions of theater and performance. The typical structures – it lasts about one and a half hours, around two hundred people are watching and you have to do something which can take place on a stage that’s 10m x 10m. An interesting thing about switching into visual arts was to say wow, maybe this work can get seen by someone who just walks by for few seconds or maybe someone sees it every day on their way to work. The space of art, but also that of a writing a book, definitely opens up possibilities of very different relations than those in a theater performance. I guess the shift to the other media was about trying to reimagine what my work’s relationship to a viewer might be. Theater has also a big social aspect where the negotiation between the construct of the audience and the performers takes place. In gallery though, works don’t usually speak to a group of people who are constituted as an audience – the encounter with the work is more private. I am interested in these other forms because they open up different kinds of possibilities for a contact with the audience. K.J. : But there must have been a reason why you started to consider the shift from a theater.. T.E. : The move was strategic in some ways. I had the sense that in theatre there’s a limit to how far you can go, where visual art offers a different economy financially, and most importantly, in the way that work is being distributed and what ambition it can have. I was hungry for that, knowing that in theatre you hit a glass ceiling at some point. Making my decisive step into art context was about opening things up, by moving sideways, trying to find a different place for the work. K.J. : Your works, from all the different forms, have a common sense of being somehow given to an audience. You have already mentioned your relationship to the audience but I am curious if this desire to create an event for a spectator is the reason why you do works you do or is it a channel through which you transmit your ideas? T.E. : I think these two things exist side by side. There’s a desire to make something happen – to stage a particular event, image or a text. But the desire is that that ‘something’ comes into a space with other people – that it starts a conversation. There is, at the bottom line for me, an interest in the act of engaging people and gathering them in a place. With Forced Entertainment over the last 30 years, we have developed a common understanding of what this kind of encounter might be, and we’ve tried many different ways of shifting and reimagining the possibilities of that space. We have gone so many different ways. We have performances that are very cold and sober and ones that are very warm and generous. We always ask what the form of theater might be, what forms of relations it might suggest and what it could open for the audience. K.J. : One of the things that Forced Entertainment uses is a duration – long performances that last many hours, and from which people can come in and go out..
T.E: Yes, yes. That’s again one of those things that arose from a frustration. While working towards an hour and a half or two hour formats (regular ‘theater shows’) we were often struck by how in rehearsal scenes events would unfold more slowly, in a different kind of time, less forced by the expectations of theatrical time. We learned that longer duration allows for different structures. Anyway – this was the context for our impulse to make improvised performances that lasted many hours – it was a reflection of what we already were working with in the studio. We made the first durational piece in 1992 and it was a very big step. The shift to longer duration was linked to the desire to open different kinds of encounters with spectators; we understood that just as the performers get to a new place in these long works – exhausted, pushed to and past certain limits – the audience gets to a new place place too. Theater gets constituted a in a new, different way. It was very exciting to do. K.J. : Do you think that durational works of theater and weeks long exhibitions in gallery spaces trigger similar proposition for the audience? T.E. : Well the duration plays differently in performance and exhibition of course. In performance the duration marks and changes the performers – they get tired, they change, the work itself changes over time. In an exhibition (mostly) the objects or installations stay the same – so you don’t feel the time so acutely. I’ve made a few installation works that do change and grow over time – so there’s a closer connection in those cases perhaps. In another sense – in terms of proposition and encounter – I think of performances and gallery work as more closely connected. An object in space is making a proposition to people looking. It opens something – an encounter, a space for imagination, a kind of dialogue. It’s the same with a theater performance, or a book, you get drawn into a relation, the relation summoned or implied by what takes place in front of you. K.J. : Do you treat your solo work separate from the work you do with Forced Entertainment or is one more of a continuation of the other? T.E. : In some ways they are separate. With the group everything needs to be channelled through the social, negotiated space of the rehearsal room. You might decide to walk one way but you end up headed in another direction because other people are pushing and pulling you as you go! As a solo artist though, I make my own direction. It can be a more private, more intuitive, less fully articulated way of working. In another sense though, a lot of the same concerns, questions, ways of thinking and working are very present in both solo and a group work. It’s also the case that discoveries and understandings made with Forced Entertainment will feed into my solo work, and the other way around. Even though different things might be operating in different fields and in different economies they surely are connected on many levels. K.J. : When talking about the creation process with the company you say that you enter a room not knowing what happens but through a discussion and negotiation things emerge. What about working alone? Do you begin with much more clearer and defined starting point? T.E. : It is different. While creating alone the intensity of an exchange or negotiation is surely not the same. Making ‘A Broadcast/Looping pieces’ I drew on various ideas I’d explored in improvising during a project with choreographer Boris Charmatz, as well as on discussions I had with the artist Tarek Atoui. I knew there was something to pursue and I just decided to arrange a performance date. I prepared as best I could but I didn’t rehearse. I didn’t have anyone to work with or feedback on what I was doing but I also didn’t really want it. I think I knew the questions that would arise if I brought my Forced Entertainment friends to the room and I didn’t want to think about this work in the same way. So I guess for that project I deliberately cut myself off in order to open up in a new way. Very often though, when I work on solo projects – art or writing – I will have people look at or read the work in progress. Naturally I tend to develop ideas by discussing; I think the ‘talking shop’ (or talking cure!) of the rehearsal room is quite a deep part of how I work. K.J. : Do you try to work with every single idea that comes to you or is it only a selection of them that you decide to invest to? T.E. : In my work and in the company’s work there’s a big history of abandoning ideas. Sometimes we rehearse for weeks and in the end have no idea what to do with the material we have made, discarding what we’ve done and effectively deciding to start again. Often years later, this kind of abandoned material will get picked up. Everything you do, even stuff that feels like a waste of time, has a kind of utility in the end and it will come back. It might take a while but everything finds it place at the end. K.J. : What triggers and inspires you? T.E. : I think that it is recognising that there is a problematic, an unsolved question or a crack. It might be in a set of gestures, a piece of text, certain presence on stage or a phrase. I get inspired by the idea of identifying this kind of rupture and wondering what more could come from it. It is like seeing a little hole or tear in reality and pulling it so it becomes bigger and bigger…This is what my solo work and the work with the company does I think, in process terms. It’s looking for a way to amplify these frictions in the room and by doing so, to trigger questions and reflections on problems outside the room. K.J. : Do you ever think of solving those problems? T.E. : No, it is more about wanting to extend or explore them. I don’t ever think about solving anything. I think about making things have material or immaterial presence in a room that would then give people sense of what the issues are, what the questions are, deliberately leaving things open for people to deal with them by themselves. K.J. : Together with Forced Entertainment you premiere a theater piece in May, ‘Real Magic’. How is that coming along? T.E. : Well, it is not really there yet! We have done three different blocks of work each one of which has been put to one side for the moment. This is how the process goes! We are in the rehearsal room again next week and we’ll be revisiting everything, trying to find a way forward. It’s always the same at this stage – exciting and nerve wracking. K.J. : Thank you for your time and I am wishing you a lot of patience and good luck. Kinga Jaczewska was born in Warsaw, Poland. After graduating from London Contemporary Dance School, Northern School of Contemporary Dance and, most recently, from P.A.R.T.S. (research cycle) she continues to work within the field of dance and choreography. Besides her performance work, she also writes and is busy working with video. As The Young One she chooses the form of an interview as it allows her for establishing a dialog with artists she admires or is intrigued by. She has join The Young Ones in September 2015.